In northern Basilicata, at the terminus of the Appenine mountain chain that forms the spine of Italy's topography, there is a spent Volcano. It hasn't erupted for 133,000 years – but its impact on the landscape and the region's wines can still be felt today. 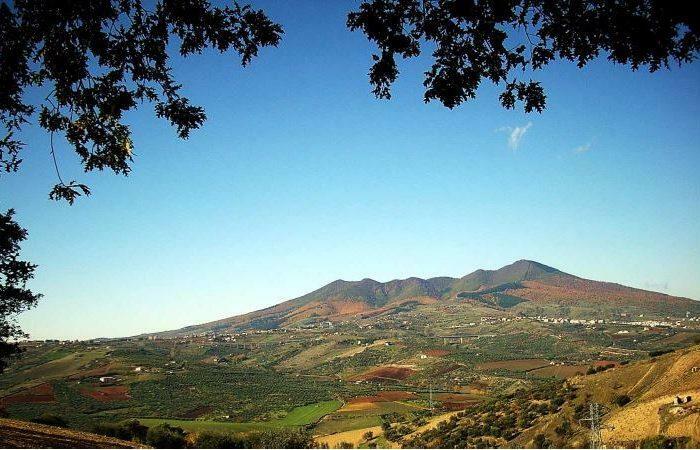 The volcano's eruptions deposited ash that over the millenia became tuff, a soil that soaks up the abundant rains in the spring, and holds them for the deep-rooted Aglianico vines during hot summers with little precipitation. The 4354 foot cone of the Volcano also plays a crucial role in regulating the weather for the vines--when the hot, dry summer winds blow in from Africa during the daytime, the evening and nights bring cool air down from the mountain to refresh the vines. Thermal excurision runs from 68 degrees at night to 104 during the day, a difference of 36 degrees! It's in conditions like this that Macarico's Aglianico thrives. The grape itself has one of the longest vegatative cycles of any, flowering in spring with harvest easily in November, and occassionally in the first 10 days of December! The vineyards are managed biodynamically and are Demeter certified, though since Macarico is a second label of a famous Vulture estate (old friends of Skurnik! ), the wines are not labeled as biodynamic products. In short, these are exceptional Aglianicos from a top notch producer at prices less than half of the more famous wines that we used to sell! Wine Information: Complex and rich in character with aromas of small black berries, licorice, and spice. The palate is powerful and smooth with velvety tannins and a pleasant balsamic note on the finish. Macarico’s flagship wine is harvested in the first 10 days of November.